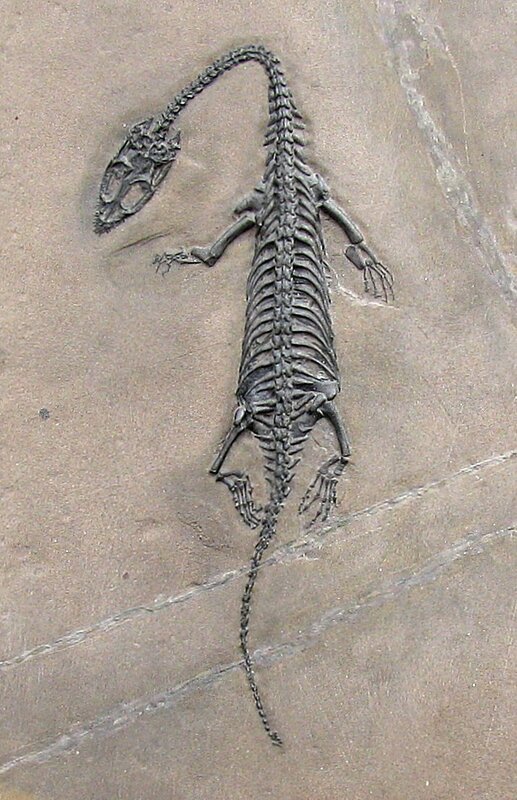 This is a very displayable vertebrate fossil. 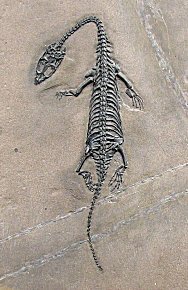 It is an excellent Keichousaurus hui from the Triassic of China. This specimen was meticulously prepared under a microscope here in the EXTINCTIONS Prep Lab. This dinosaur-like reptile is very well-preserved and exhibits extremely fine detail - the bone structure is just incredible! The head, long neck, body, limbs, and lengthy tail are all intact. The legs are nicely displayed, almost all of the tiny digits of the feet are present, and MANY sharp teeth are fossilized! The complete Keichousaur has great color and contrast and is beautifully showcased on the rectangular plate of shale. But that's not all - this fossil comes with its own wood display frame.The matrix plate was secured to a board, and then matted and framed for optimal display! This is a fabulous, professionally-prepared, complete example of this dinosaur-like reptile from the Triassic - easily one of the best we have ever seen.